I was an auditor with the National Audit Office, formerly the Exchequer and Audit Department. I started stamp collecting when I was eight years-old and moved on in the late 1960s to collecting Postal History which is basically collecting stamps on their envelopes. I was a member of the Civil Service Stamp Club when they were clearing out the basement of Somerset House, London, where a flood had destroyed a lot of documents stored there. A friend gave me three letters with Box datestamps on them because he knew I came from the village. Detail of the post marks both dated 1849 where the local Box post mark is shown alongside a Chippenham mark. The purpose of the datestamp or postmark was to record the time and location where the item had been delivered into the care of the service delivering them. Villages such as Box were designated as Sub Offices of larger towns like Chippenham. Until the 1880s envelopes sent from villages would have had their stamps cancelled at the Main Office and the Sub Office datestamp of the village usually applied on the reverse of the envelope. The letters which I was given were dated 1849 and would have had Penny Red stamps (1d) cancelled with the 191 numeral cancel of Chippenham. They were different to the killer, which was the lines used to cancel a postage stamp. Once the stamp had been used the letter was the responsibility of the Post Office, not to be handed back to the customer but delivered to the addressee. 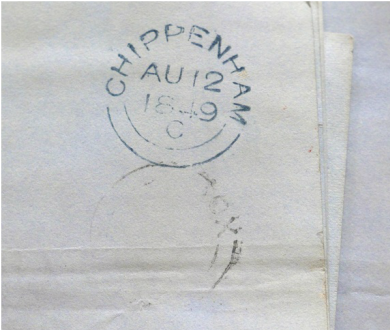 The circular Box post mark was used until the 1860s, then the postage stamp marked Chippenham until the 1890s when a Box, Chippenham stamp was used, now altered to Box, Corsham. The stamps that I was given were after the introduction of the first adhesive postage stamp, the Penny Black, in 1840 and the Penny Red a year later. They were on letters from Mr Williams, Supervisor of the Box District (Inland Revenue) relating to an infringement of the licensing laws in Trowbridge. 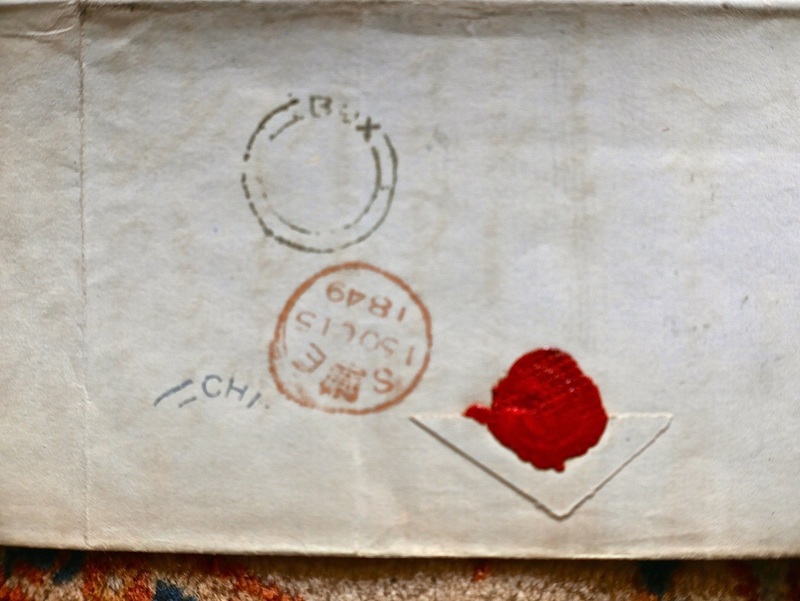 They are dated 1849 and the Penny Red stamps have floated off, which would have been on the letters (and cancelled with a Chippenham post mark). To put the date into context in Box's history, 1849 was eight years after the opening of the Box Tunnel when the village became part of the route between London and the West. These were very early days for the postal system in general and still six years before John Picton opened the first Box Post Office. 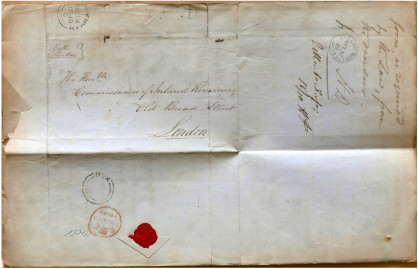 The letters to which the postmarks were attached were for the attention of Mr Williams, a Revenue Officer, and were addressed to The Honourable, the Commissioners of Her Majesty's Inland Revenue. 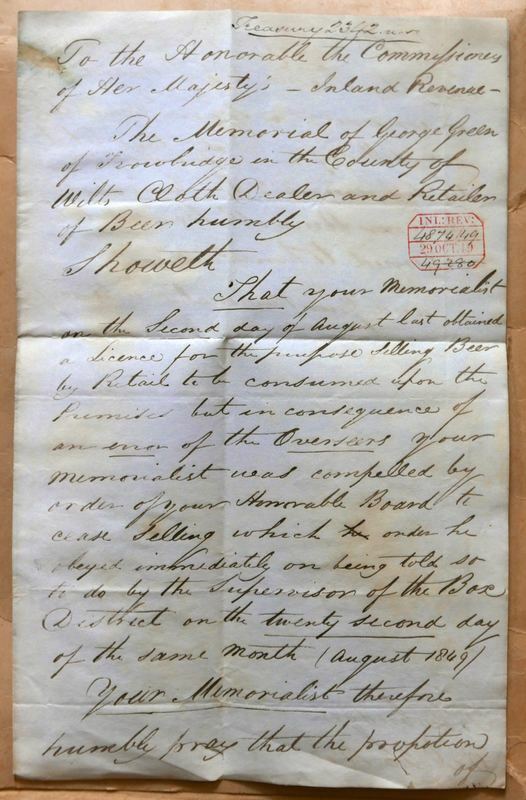 The three letters in 1848 were referring to George Green of Trowbridge, Cloth Dealer and Retailer of Beer, who was appealing against refusal to licence his premises for the consumption of beer. One confirms that he had paid a bond of £15 for relief of the poor to the satisfaction of Rev JD Hastings, Rector of Trowbridge, Overseer of the Poor. George Green of Conigree, Trowbridge, was described as Dealer in Beer in the 1851 census but appears to have no Box connections. Rev Hastings was a well-known Trowbridge person. In 1852 he was engaged in another project, building a new church, St John's, Upper Studley, Trowbridge, whose foundation stone was laid in 1852, at the sole cost of a benevolent and Christian friend, who placed in the hands of the Rector £1,200; viz £1,000 for a church and £200 for a schoolroom. The datestamp / postmark shown on these letters is the first one used by Box and it would be interesting to give details of the later ones in a further issue of the website. I have no idea why the infringement of a Trowbridge matter would have been dealt with by Mr Williams, who appears to be from Box, and I would be interested to receive any thoughts on the matter.